Hello lovelies, I hope you are having a lovely bank holiday weekend so far. Last weekend was the #bigbloggerconference, amongst the brands there was lookfantastic and they were very generous and were giving out their latest beauty box. In their beauty box was Alterna's Caviar CC Cream and I honestly do not know how I had not heard of this product before. 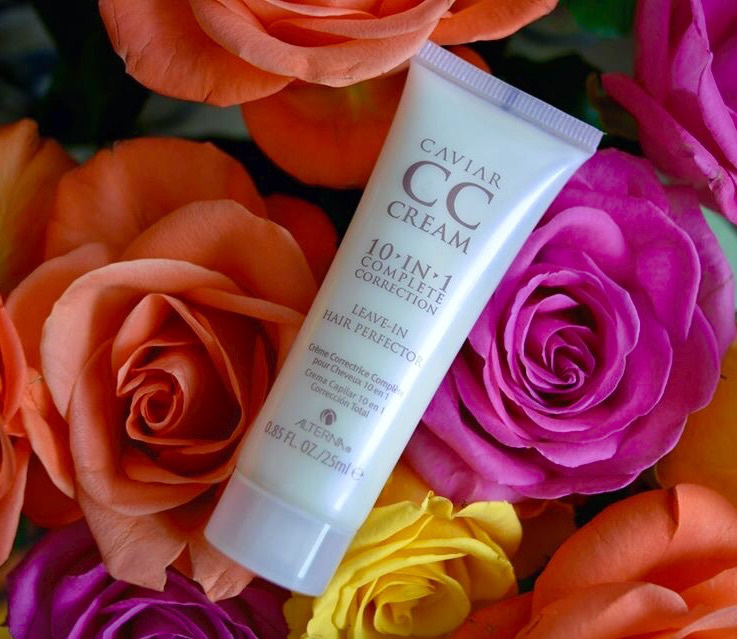 Product description: Helping to leave hair feel polished and soft to the touch, this Alterna Caviar CC Cream is a miracle, leave-in product that delivers 10 benefits in just one easy step. Delivering expert help with moisture, shine, smoothness, softness, UV protection, manageability, strength, anti-breakage, heat protection and hold, this cream can be used alone or underneath other styling products. This haircare product is truly amazing and it is hands down the best haircare product I have ever tried, all the other products I have used in the past pale in comparison. The name itself makes you feel that it is a luxurious and rich product for your hair, when you think of 'caviar' you think luxury. I honestly do not know how I have lived without Alterna's Caviar CC Cream and will be very sad when it runs out! I have used the CC Cream on wet and dry hair, both results are extremely satisfying and I absolutely love how my hair feels. My hair can be a little bit dry at times and I get split ends quite easily, which is why I was eager to try it out as soon as I saw it in the box and if it could help the growth/strength of my hair. I could feel an instant difference in my hair after applying it and when it dried, my hair felt so much smoother, soft and shiny. The ends of my hair feel so much better and less rough, don't get me wrong I still have split ends but they look tidier now and just as shiny as the rest of my hair. Another plus is that you can use it with other styling products and not run the risk of ending up with greasy/flat hair if you mix two different brands. The scent of the Caviar CC Cream is incredible and very captivating, it smells heavenly and I keep catching the fragrance throughout the day. You only need to apply a small amount to your hair, which is good as it means the product will last longer. Alterna's Caviar CC Cream costs on average around £24, which is a little bit steep but it is true that you pay for quality and the Caviar CC Cream is definitely a high quality product. When trying out a product I always ask myself if I would recommend it to a friend or buy it again, in this case I definitely would. It is out of my price range at the moment but I would get it again in the future as I think it has helped to nourish my hair and keep it hydrated. I also really want to try more of their products in the future, especially their Caviar and Bamboo shampoos and conditioners. I have seen quite a few good reviews on their products helping with hair growth so I definitely need to invest in them at some point.